The office of the Translational Lung Research Centre Heidelberg (TLRC) provides administrative support for the principal investigators, the steering committee and the executive board. The office also serves as the first port of call for external communications with the scientific community, the media, and funding bodies. We support and administer 34 research groups working across the 4 local partner institutions in Heidelberg (Heidelberg University Hospital and Medical Faculty Heidelberg, DKFZ, EMBL, Thoraxklinik at Heidelberg University Hospital). We are one of five regional offices contributing to the overall management of the German Center for Lung Research ( DZL). 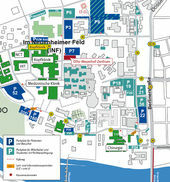 The TLRC Office (room 01.704) is located on the top floor, Im Neuenheimer Feld 156, 69120 Heidelberg.